A great time to head to Miami! November is a great month to visit Miami! Not only is the month packed with pre-holiday prep and fin events, the humidity of the summer has cleared up significantly and the weather is outstanding. Everyday is a perfect day to relax by the beach or take a walking tour of the city, you really can't go wrong. Early November kicks off with Miami Live Arts Month, an annual event that residents look forward to every year. By the end of the month, the holidays are in full swing and every corner of the the city is lit up and glowing. Early November is still a pretty quiet time for tourists, but as you near Thanksgiving, the city starts to fill up with all the vacationers. This just means you should plan ahead, so make reservations, or order tickets to activities ahead of time. Of course, if you're just looking to head to the beach, yo'll be fine. November is one of the nicest months to visit Miami. There is little humidity and lots of sun. Everyday is like the perfect summer day. Although hurricane season is still technically in effect, it officially ends November 30th, you usually won't get much rain. On average November has seen about six days worth of rain, but remember this is Florida where it rains for about 20 minutes and usually not until the late afternoon. The weather is warm and sunny in November, but it can get a bit chilly in the early morning or later in the day. You'll need your typical summer gear for during the day hours, shorts, t-shirts, bathing suits, and of course sunscreen. Pack a light zip up or long sleeve t-shirt for the chillier hours, just to be safe. · Miami Live Arts Month: Experience live music, entertainment, art, and great food all month long at Miami's Live Arts event. Discounts and special offers are abound all month for concerts, shows, live events, restaurants, and hotels across the city. · French Weeks Miami: (November 8th- 16th) Every year in November, the French-American Chamber of Commerce organizes French Weeks Miami. This French Festival showcases the richness of France with social, cultural, and educational events. · Santa's Enchanted Forest: (November 1, 2018- January 6, 2019) Miami's Tropical Park is transformed into a winter wonderland amusement park filled with rides, carnival games, shows, and of course a 92-foot tall Christmas Tree. Day passes or season passes are available. Children under 2 are free. 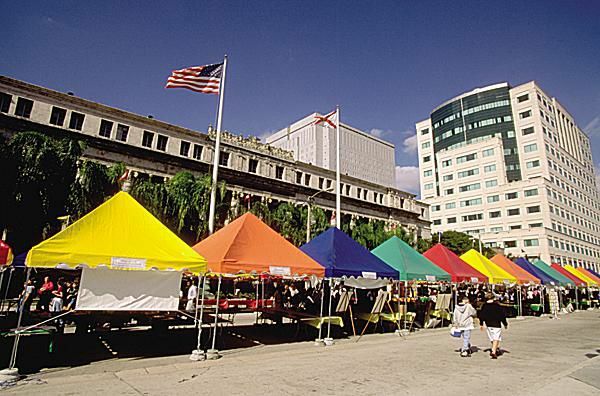 · Miami Book Fair International: (November 11-18, 2018) Downtown Miami's annual book fair celebrates authors, writers, and poets from across the world every year by bringing them together for this one special week. Thousands of book lovers flock to the city each year to hear book talks, meet famous authors, and mingle. Certain events require pre-paid admission, check the site for ticketing information. · The White Party: (November 24th, 2018) Every year Care Resource holds The White Party to raise money for healthcare and services for South Florida's underprivileged communities. In the past the party has raised over a million dollars and continues to be a fun, extravagant, and charitable night. The party is held at the Vizcaya Museum and Gardens and admission starts at $250 per person. · Seed Food & Wine Week: (November 7-11, 2018) Whole Foods presents the first plant-based food and wine show in the country and includes events throughout the city. Over 200 exhibitors and 10,000 guests attend the event. Expect fun tasting activities, lots of yoga, and wellness advice. Some events are free, while others require admission. Check the site for specific schedule. · Sunny Isles Beach Jazz Festival: (November 14-18, 2018) Gateway Park hosts the 11th annual Sunny Isles Jazz Festival which features a wide range of jazz musicians. General admission is $10. VIP tickets are available for $50 and include reserved seats and food and beverages. · If you're planning on visiting towards the end of the month, book in advance. The city tends to get busier the closer you get to Thanksgiving. · Remember Election Day and Veterans Day are both early in the month and Miami public schools are closed on both days which means tours attractions, museums, and the beach will be a bit more crowded than usual.